The Rick Hinderer Investigator Pen is the kind of tough, state-of-the-art compact tactical pen you expect from a high-end, CNC- and CAD/CAM-designed product. Enjoy the pen's ergonomic feel as you revel in its inherent protection. Rick Hinderer, who has extensive experience as an EMT and diver, designed the Investigator to be smaller and shorter than his other tactical pens while maintaining the same durability, grip and striking ability. It has all the qualities of a premium writing tool as well if you have to quickly write down information in tough conditions. Made in Shreve, Ohio at Hinderer's metal shop, this copper EDC pen will go the extra mile (or page) for law enforcement and military personnel. With black bold ink and available Fisher Space Pen full size refills (pn# SPR4B),this rugged tactical device is not only a smooth writing instrument, but a close-quarters tactical protection piece as well. Rick Hinderer EDC Pens with cap on are 4.25 inches long, 0.375 inches wide and are only 1-ounce, but have the fierce ruggedness you need in close-quarter altercations. It is machined to withstand blunt force easily and ergonomically designed to provide solid grip as well as functionality. Everyday carry is easy when you have a practical and lightweight yet strong compact device. The Hinderer Knives Investigator has many of the same design concepts as their other tactical pens but in a more compact size. This includes the deep traction grooves on either end of the pen, coarse high threads that add strength and the "overbuilt" construction to withstand battlefield situations. The titanium pocket clip allows you to easily carry the pen in a shirt or pants pocket, and the overall size works great for small notebooks. You can screw mount the cap on the back of the pen when writing. This pen is proudly all American made and features a stainless steel bullet tip and nib that keeps either end working flawlessly. This model of the Investigator has a rugged copper cylinder with a brushed satin finish. It is available in brass, titanium, hard anodized aluminum and stainless steel as well. 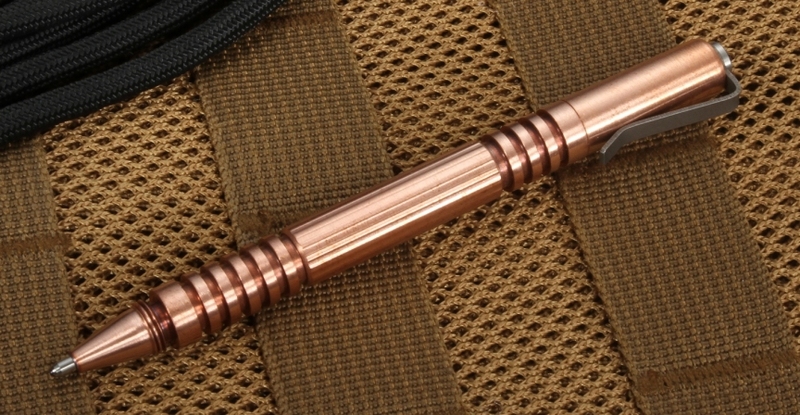 The copper will patina over time and give your EDC pen a unique time-aged look. 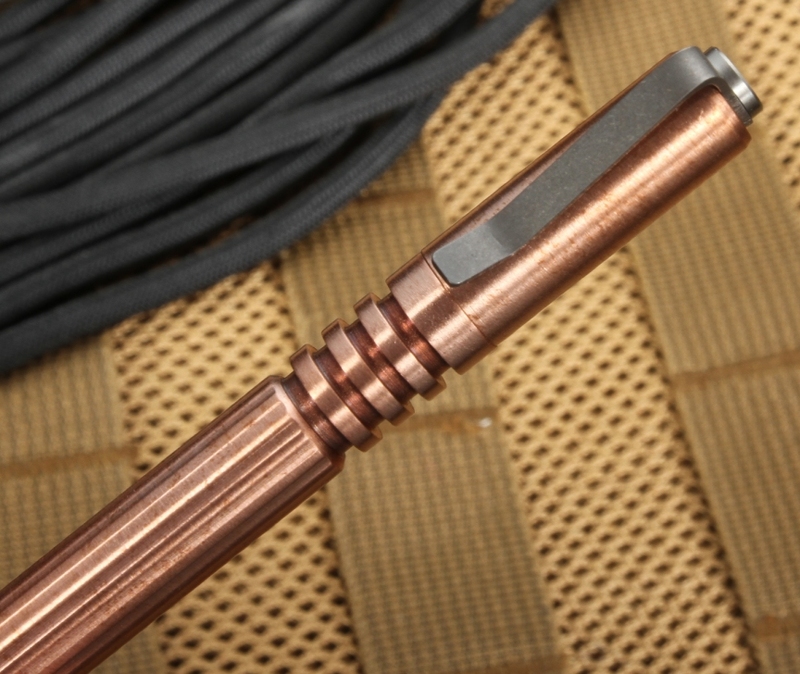 The copper also provides a heft that you can feel in your hand compared to the lighter hard anodized aluminum model. Looks match performance, as this everyday carry pen has grooves that meet your finger grip for best protection and quick defense. 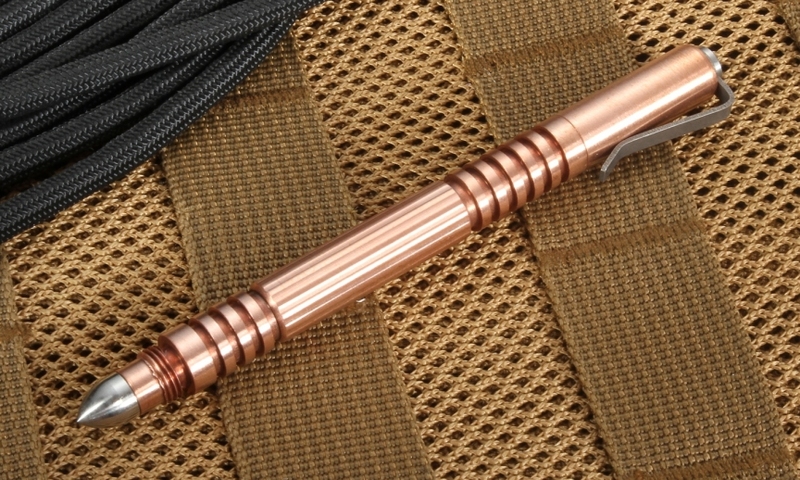 And like all Hinderer tactical pens, this one has a modular design. 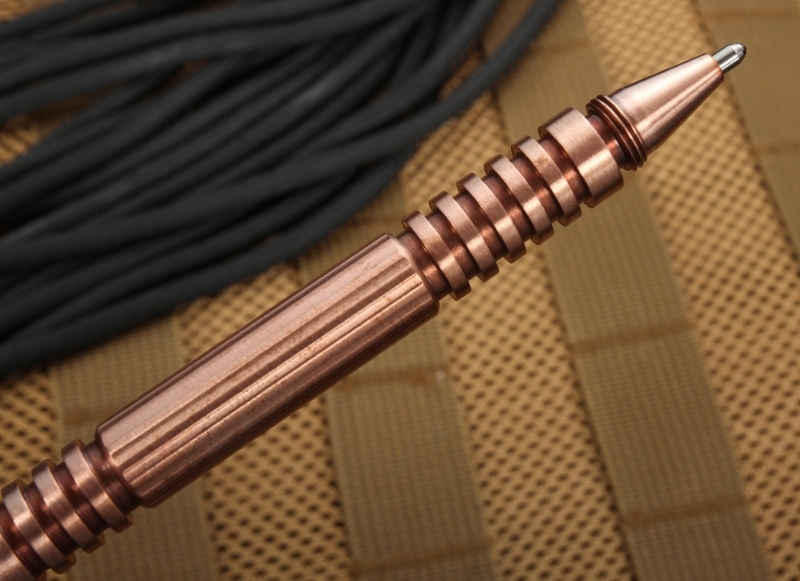 Remove the stock bullet and add any number of separate stainless steel threaded attachments such as warheads and flat ends to maximize your combat technique. The Investigator pen gives users a discreet carry protection option in places where guns and knives are not permitted. In addition to first responder use, it can be a useful defense tool for civilians who live in dangerous neighborhoods or travel at night. With fast same-day shipping, you are assured a quick product delivery of your Hinderer everyday carry writing pen. We are an authorized dealer that sells Hinderer products with pride. You can order our curated merchandise with confidence. Our business model is as rugged and reliable as the merchandise we offer, and we are here to serve those who expect the best in their tools. Bought the Investigator pen to use daily it needed to be small enough to fit in my pocket but big enough to not disappear in my hand. This pen did the trick perfect size and has a nice weight to it. Love how it feels and still writes nice for a pen you can still jab in someone's eye.